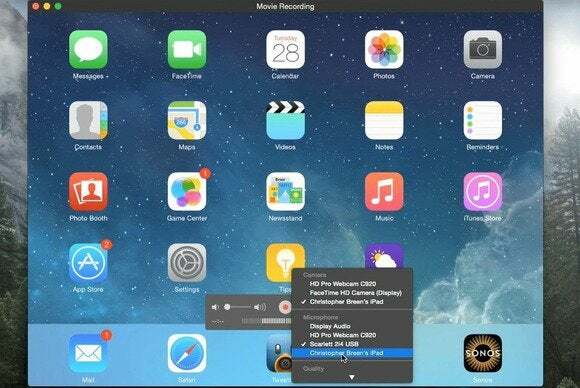 Today’s tip is short but sweet— how to capture the video and audio of an iOS 8 device that’s attached to your Mac that’s running Yosemite. This isn’t the kind of thing that everyone will want to do, but it’s great for app demos and presentations where you want to incorporate iOS capture. And the quality is better than anything I’ve achieved with methods that leverage AirPlay. To begin, connect your device to your Mac via the syncing cable—note that your iOS device must use a Lightning connector as a device with a 30-pin connector doesn’t work. I’m using an iPad Air. In the resulting window click on this triangle menu and choose your iOS device from the Camera section. When you do, your device appears onscreen instead of the image from your Mac’s FaceTime camera. Click this menu again and you see that you can record from additional audio sources—I’m going to continue recording from my USB interface, but I could choose to record the iPad’s audio if I wanted to. Then click on the Red record button and start doing stuff. When you’re finished. Click Record again to stop.